Every year, in an attempt to stave off the crowds and the traffic and the insanity of everyone rushing to get their tree and the Black Friday deals and post-holiday chase of pre-holiday shopping and decorating, I avoided it until just a few weeks before Christmas. But then this year Thanksgiving came late. Then this year, my oldest daughter was in college and was only home Thanksgiving Thursday until Sunday morning. It changed the whole routine. We had our dinner, all of that, I worked on Friday . . . and then I did what I was loathe to do all those years I was married: I started the Christmas rush. It’s not like it was unwarranted, it’s only a few weeks until Christmas – which is when I normally did all this. So yesterday I loaded the kids into the car, drove up the hill into the mountains and found our annual tree farm and we got a tree. We got home, let gravity do its due diligence on the once-wrapped branches and pull them back down, and got out the boxes and boxes of Christmas stuff. I normally wouldn’t do all this in a single day, it’s a lot of work, it’s a lot to deal with having four kids in the house . . . but our time with Abbi, my oldest, was limited. So we got out the Charlie Brown Christmas record (on green vinyl, no less) – which is the best Christmas record ever, hands-down – and started. This was, by far, the tallest tree I think I’ve ever gotten. We had to get a ladder to put on the tree topper. 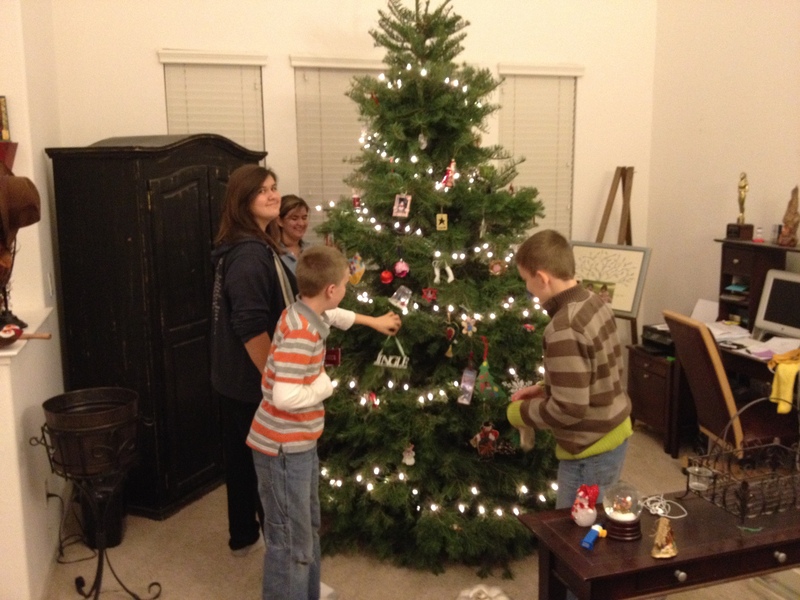 I had to herd the kids like cats around the tree . . . but we had hot chocolate, listened to jazz-influenced Christmas music, and then went to bed far too late. Where this could have been a difficult and sad day since Abbi was leaving on Sunday it wasn’t. She’s returning in just a couple weeks for Christmas. So today, after she left, I started to put the lights onto the house and realized that the lights we’d used for years were destroyed by a wind storm last year. I bought new lights, looked like a pregnant penguin trying to climb on the roof in my sad shape, and put them up. I got in the house, reorganized the way I put up the decorations in there and realized that this was a change we needed. Each year, you see, we’d tried to decorate the way their mother did it and this year I came to the conclusion: I can’t. I don’t have the eye, the fortitude, or the patience she did. I also just don’t have the same style sense. It seems a little odd for a guy raising his kids – where there are three guys and one girl in the house now – to have leopard spotted bows on a garland across the banister. So I’m rearranging things. 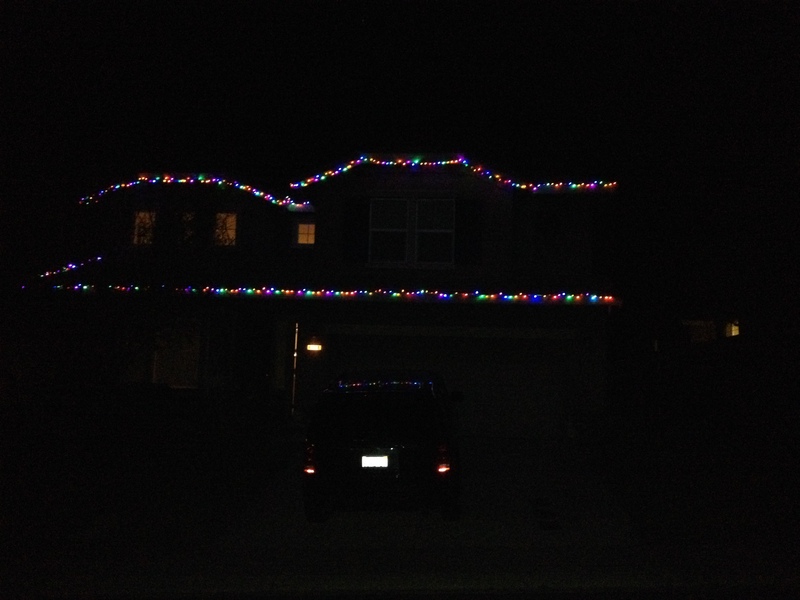 I got the lights and the garland up. Santas are placed on the ledge with care. The stockings are up. The majority of the house is done. I worried I may have gone too far afield. It’s a different kind of tree. It’s a different way to decorate. The lights are colored, not all white or all one color. It’s just totally different. That . . . meant the change had done us some good.